In my house, we are kind of rice fanatics. 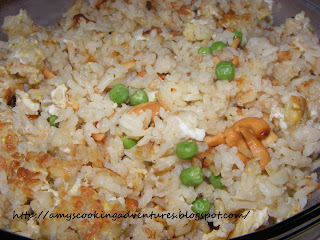 Rice is my favorite side dish and it is one of the few foods that I know, without a doubt, my 2 year old will eat. I like making this one is particular because my son usually won't eat the main dish, and this side dish offers protein in the form of the nuts and egg. I have also added some green tea to the mix for an extra boost of antioxidants. The only down side of this recipe is that is uses obscene amounts of chicken stock. So, if you are on a low sodium diet, I would suggest making something else. I have tried cutting down the amount of chicken stock, but it really compromises the taste and the look of the egg rice, so I just try not to think about it! Combine white rice, water, and chicken stock in a pot. Steep tea bag on the pot. Once the water starts boiling, remove tea bag, stir, reduce heat to low, cover and simmer for 18-20 minutes. Add olive oil and garlic to a large skillet or wok. Lightly saute garlic for about 1 minute. Add rice. Cook over medium-high heat for 5-10 minutes, stirring and flipping occasionally until rice is beginning to brown. Reduce heat to medium. Move rice to create a well in the center of the pan. Pour eggs into the well and let fry, stirring frequently. As you stir the egg, rice will begin to fall in and mix with the egg. Once the egg is cooked completely (about 5 minutes), Stir in cashews and peas. Continue cooking until the cashews are a bit tender and peas are warmed through. Serve with your favorite stir fry. Enjoy! is the amount of 2 TBS of chicken stock not correct?